Well this week will be occupied with COSPAR 2018 in Pasadena, but in the meantime we can report on the first light through the telescope to the new camera and also report on the latest news on the multi-messenger astronomy front. First up, check out the computer controlled filter wheel in the photo below. There are eight slots for filters and for now we only have four filters. It was easy to install the filters and I was eager to try out the new camera. 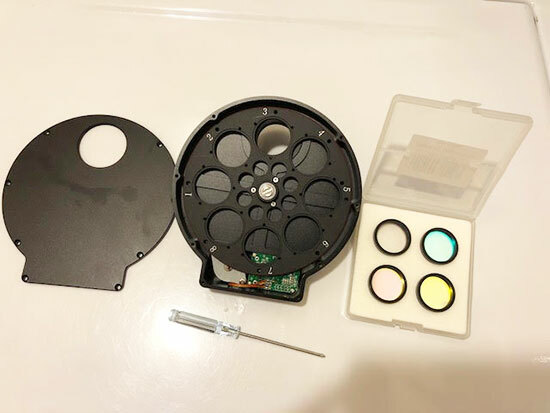 So with the filters installed, I reassembled the camera and filter wheel and attached it again to the 80mm refractor, as originally shown in the photo in the July 13 2018 blog post. I didn't have time to wait for nighttime, so I just slewed the scope so that it looked out the office window and hooked up the laptop and turned on some camera vendor software and took a couple of images. Umm, something was not right. Even though I could see the camera was responding to light and dark splotches I could not get the camera to focus on anything. Now I had been cautioned about ensuring that the telescope had enough back focus to match the focal length of the camera, so it seemed an easy thing to just add an adjustable extension, which gave me about 30mm more of back focus movement. The screenshot below shows the improvement with the additional spacing. Hooray, now it seemed to work fine and in fact with that simple change, when I looked at the captured image, I discovered that I had captured an image of life in my telescope. 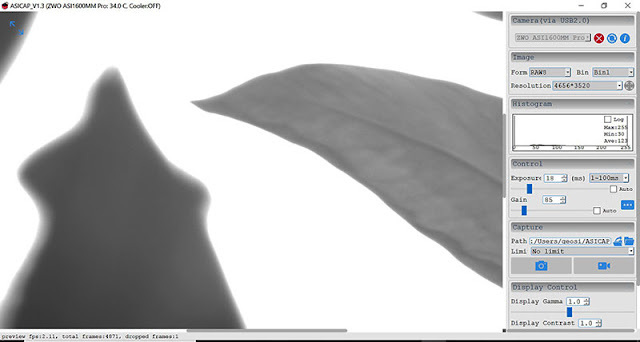 Ok, ok, its is just a leaf on some tree outside, moving about in the breeze, but at least the camera seems to work ok. 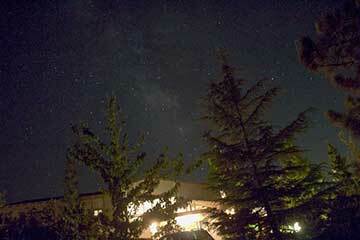 There should now be enough focus control to focus on astronomical objects. I operated the filter wheel and that all seemed to work ok, so I just did a screen capture of the image and software settings. Next time, I will try the camera with some of my other ASCOM controlled astronomical software. So, there was no more time to play around with the new CMOS camera, but this exciting announcement regard the new stage of multi-messenger astronomy deserves some attention. Previously, you will recall, we had several posts that described the benefits of multi-messenger astronomer based on the then new technique of observing the same astrophysical event in optical wavelengths while simultaneously observing he gravitational waves associated with that event, in this case a merger of two large compact objects. 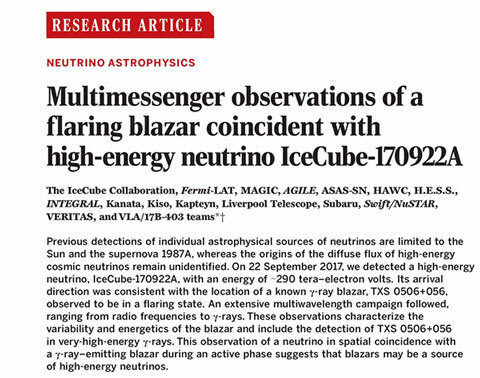 This new multi-messenger technique is where observation of neutrino flux is observed at the same time as gamma ray flux originating from the same astrophysical event. Check out the following announcement and diagrams, all abstracted from the Science Magazine, 361, 13 July 2018 issue. As the announcement says, the source of cosmic neutrinos had previously only been identified with the sun and supernova 1987A. Now the detection of both neutrinos and gamma rays, with pretty good statistical confidence that they both come from the same object in space, is pretty amazing news. One question you might have is given that neutrinos hardly interact with any material substance, how can the direction they come from be determined. 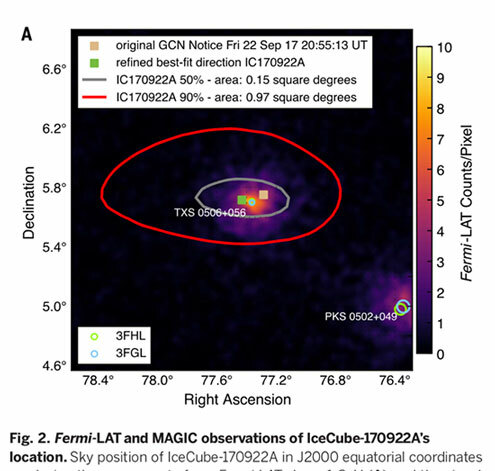 Well, in this case the IceCube detector in Antarctica is able to identify a probable direction from which the small, but significant burst of neutrinos came from. Then, given the time of day of occurrence, it is possible to calculate the most probable right ascension and declination of the event in the sky. With this information, other telescopes, which more easily provide RA and Dec for their pointing positions, can be brought to bear on the possible source. Since the detection of neutrinos is very difficult since they hardly interact with anything, the small numbers of detections requires a lot of statistical analysis to make the detection meaningful. Check out the statistics below which shows several years of neutrino detections, all of them here, estimated to come from the same RA and Dec in space. Because of the small numbers, the results are always presented with a certain level of uncertainty. Note also how this same astronomical location is suspected of previous events which also generated large excesses of neutrinos. The neutrino observation event, 170922A, is shown all the way to the right in the figure. Now, the detection of excess gamma rays, identified as object TXS 0506+056, is at the same location that is the most probable location of the excess of neutrinos. Remember that the reporting nomenclature used for Fermi is the numbers after "TXS" represent the RA and Dec of the object, where RA is reported in hours and minutes. This means that"0506"would normally represent the same as 5 * 15 + 6 * 15 / 60 = 76.5 degrees. Hmm, why doesn't that calculation agree better with the chart below? Ok, ok, I see what is going on. The objects coordinates have been reported in epoch J2000 instead of the usual J1950 coordinates, which one can use a simple, but not quite accurate, correction by adding about 0.7 degrees to account for precession of the Earth's orbit. Anyway, the simultaneous nature of these two observations is pretty neat, even given the statistical uncertainty and indicated significance level! This new astronomical window will find many more objects like this in the future! If you are interested in all the details of this report, be sure to look up this issue of Science magazine. Well, the time for COSPAR 2018 has finally arrived. As was mentioned in a previous post, COSPAR stands for the "Committee for Space Research" and the week long conference has multiple ongoing sessions dedicated to specific areas of scientific research. For instance there were session tracks that specialized in Earth science, Earth Climate, Earth upper atmosphere and atmosphere of exoplanets. Other sessions dealt with astrophysics, magnetospheres, cosmic rays, gravity and dark energy and dark energy, and materials for space exploration, and life sciences related to space. There were so many sessions and different tracks, I found it hard to decide I was going to spend my time. 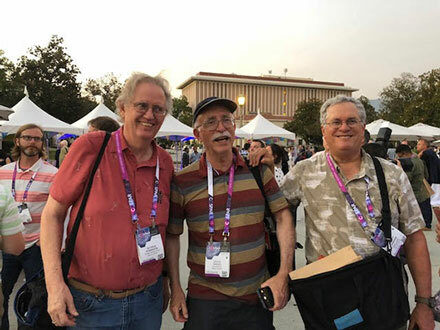 Anyway, my first task was to meeting up with other OCA astronomers and physicist wannabes like Math Whiz, Dave, and Science Nerd and Theatre Impresario, Scott. Here we are after feasting and drinking at the COSPAR reception held at the Pasadena City Hall plaza. This was just plane fun, but tomorrow we will have to get down to business and try to learn something!